Join us from 2.00pm as we call all the Round 17 action against Central District LIVE! Slightly overcast here at Hickinbotham Oval with the game about to get underway, Matt Rose led the team out and through the banner as he celebrates his 50th SAFC milestone and 100th SANFL milestone. One late change for the Panthers today with Brad Crabb having to sit out with a hamstring injury replaced by Cam De Visser, Matt Rose will captain the side for today's game. After a fiercely contested contested couple of minutes the first Goal goes to the leagues leading goal scorer in Brett Eddy who slots one from around 35 out. Breakaway goal after a Panther turnover for Centrals No. 52, Presbury. Trent Goodrem #11 for centrals also getting on the board and shortly followed by a 40m goal from #42 Codey Ellison for the Panthers, 2 goals a piece at this stage. Poor turnover in our back 50m from E-man leading to another major Score for the Bulldogs, he might be getting a spray on the sideline as he heads to the interchange, Goal to Caleb Edmead #2. South are going to have to tighten up their play if they want to come out on top. Quickly followed by another South clearance and then goal going to forward livewire Rigby Barnes who has been active early. As a little bit of rain starts to come down here at Hickinbotham Oval Brede Seccull records another disposal, now has 7, tied with Bulldogs Barmby and Jansen. Big Grab from Brett Eddy in the forward 50 who kept his feet and then played on and beat his defender to the goal square kicking his 3rd of the game. Centrals get on the board again after Panther #33 Taylor, finds a teammate with a through the legs of an opponent hand ball, or in other words a "nutmeg", shortly followed by a turnover at the stoppage and then a 50m goal from from Kyle Jenner. Turnovers continue to be the story for South so far. Kyle Presbury caught E. Irra, holding the ball 30m out from goal and kicked another quick one for Central just before the siren. Tight contest all across the ground which is reflected on the score board. South got off to a sloppy start with several turnovers which led to Bulldog goals although bounced back led by 3 goals from Brett Eddy and 10 disposals from Adam Gulden. Second Quarter is bound to be a big one! South worked the ball all the way from their defensive goal square, Seccull and Cross linking up several times to find Eddy on the 50m line who slots it for his Fourth major. Quiet Quarter on the scoreboard so far although Great Defensive 5 minutes from the Panthers although still unable to get the ball up forward, Central's applying all the pressure they can and have had several stoppages in their forward third. Centrals playing a spare man back trying to slow down Eddy, will see how that goes since Brett is playing like someone whispered "Ken Farmer" in his ear just before the game. Couple of behinds in a row from the Bulldogs (5.5), up the other end South showing why they are ranked No. 1 in the league in accuracy rating (7.1). 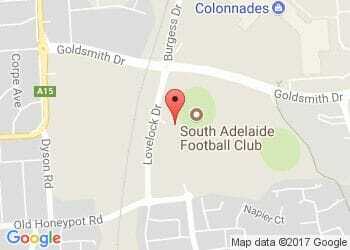 Huge Goal from Joel Cross who kicks just as the siren sounds, puts South ahead 51 to 31 at half time. South had a great second Quarter holding Centrals to just 3 points, early it looked like the Bulldogs where going to be on the front foot although they were unable to capitalize and the Panther back lines held strong. Eventually getting the ball forward where our forwards were able to get to the ball first and apply good pressure when they didn't and slotted a couple to put South Adelaide ahead going in to the second half. 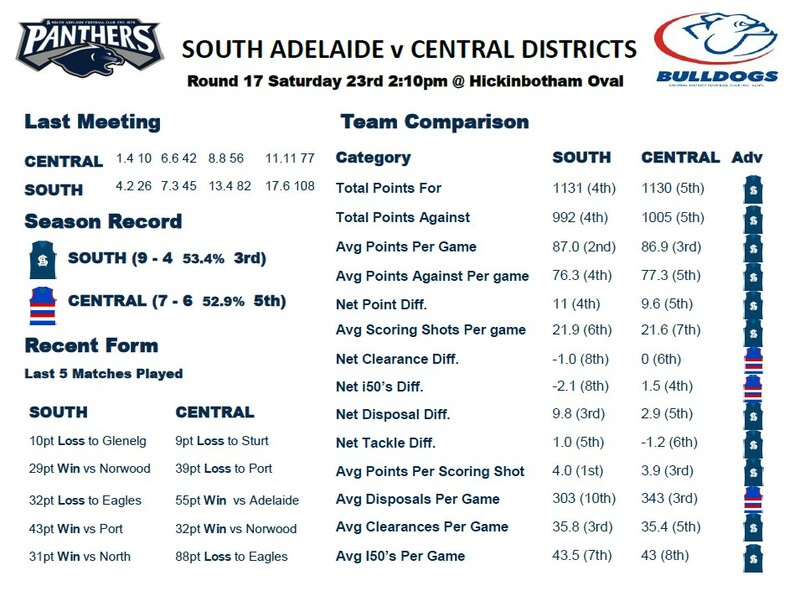 Earlier today in the reserves match Centrals came out on top 74 to 56 led by Hanna (34 disposals and 5 tackles) and Baldwin (33 disposals and 12 marks). For the Panthers Ben Heaslip who is out of the league side this week had 34 touches of his own as well as 7 important clearances. Off and running and the quarter starts with South finding Brett Eddy again inside 40m although is unable to kick his fifth and instead puts it through for a behind. Nick Liddle shortly after ran away from a stoppage with the ball in hand and found Brede Seccull running back towards goal. Brede kicked his first to put South up 58 to 35. Score is 58 to 43, South up. Accuracy seems to be the difference at the moment as both teams have had the same amount of scoring shots. Centrals continue to fight and kick their second in a row, although South win it out of the middle and find Sam Overall who kicks his first from a tight angle. Game is going back and fourth this quarter so far. A dropped mark and then a missed handball from two different Panther defenders led to a third goal for Presbury, the Bulldogs gaining momentum now and win another clearance to get it up forward again. I stand corrected as the Panthers work the ball out from their defensive 50 and find Sam Overall in a marking contest who dominates his defender in the air and lines up to kick his second in a row, breaking the momentum that Centrals created. Score is 70 to 56. Bit of blood here due to the tight contest between the Panthers and Dogs, tackle count is high and tied on 54 a piece. Dogs go forward again with a goal from Sam Milne as time is running out in the 3rd, narrowing the gap to 7 points. Centrals won the third and were able to narrow the gap to just 7 points going into the fourth. Slow start to the final quarter although a mark that slipped through a Panthers fingers led to a open goal for Sam Milne who kicks his second for the Dogs. Margin is down to 2 points. Joel Cross turns on the speed out of a marking contest and slots his second to put the Panthers back up by 8, we needed that one! Brede Seccull reels around just within 50 and slots another one for the Panthers, currently has 23 disposals to go along with that goal. South are up 83 to 75. The goals keep coming, another one this time for South after some slick soccer skills from the "best #43 that has ever played for South" (A. Guldens words) which led to a goal from Nick Liddle who also has 21 touches. Cam De Visser showing that putting him in the team at the last minute was no mistake with an important run down to force and out of bounds kick. Unlucky point for South as Joel Cross plays on and slicks in the goal square although is still able to get it onto a team mates boot, unfortunately it hit the post. Big contested grab late in the game from McMahon is followed by a dead straight kick on an angle that put another 6 points between South and Centrals just before the final siren. What a great game here at Hickinbotham Oval, it was tightly contested from the first to final siren with the Panthers only able to really pull ahead in the final quarter. Seccull finished the game with 33 disposals and 2 goals, and Cross with 26 disposals as well as 2 goals of his own. Eddy added 4 majors to his season tally, despite being unable to kick one after the 2 minute mark in the second quarter. Make sure you keep your eyes on the website for a full Match recap coming on Monday and then previews as we prepare for our match up next week with West Adelaide.